The cover art is not exactly what you'd expect to see on a Shinobi game. The Shinobi series is one of my favorite series of games during the late 80's and early 90's. Sega was on a tear at the time, with stand out hits such as Out Run, Space Harrier, After Burner, Alien Syndrome, and others ruling the arcades. Shinobi was a bit of a departure from its Sega brethren, opting for side scrolling, platforming action rather than super scaling graphics and psuedo-3D visuals. It was a deliberately paced platformer game, that slowly guided the player through the necessary skills early in the game. The clever use of levels, shurikens and melee attacks, and ninja magic were refreshing attributes that helped Shinobi make a name for itself. When Sega released the Genesis console, the next entry in the series, The Revenge of Shinobi (ROS), was heralded as an instant classic. 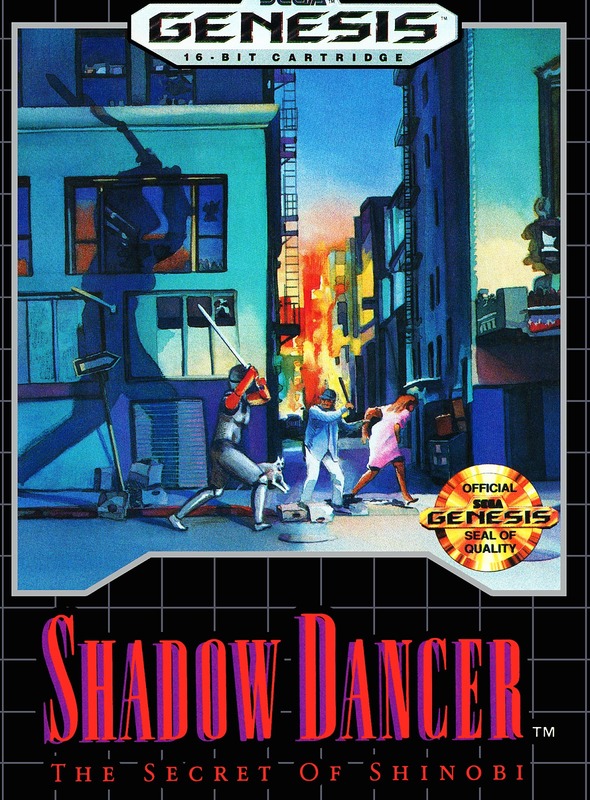 There is a lot written about that game, so I wanted to review its lesser known Genesis follow up, Shadow Dancer: The Secret of Shinobi (SD). 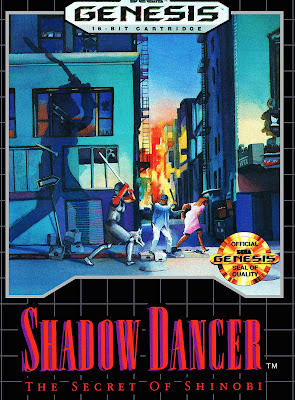 Shadow Dancer was a confusing entry in the Shinobi series for a couple of reasons. First of all, the North American Box art obfuscates the fact that this is a Shinobi game. You can kinda tell if you look close, but its not obvious. The Shinobi name is in the subtitle, but the subtitle text is so small that it would not be readable from behind a counter. If Sega wanted it to be known that this was a Shinobi game, they sure didn't try too hard. Consider also that the game play is more like the original arcade, and not like its Genesis predecessor; it is almost as if the two games were produced by different teams as there is no real continuity between them. Whats more, the third Genesis game, Shinobi III, The Return of the Ninja Master (SIII), is a great follow up to ROS...except that it follows up SD. SIII plays more in the style of ROS. So what it comes down to, is that two of the games in the series play with an arcade feel, with fast action and single hit deaths, and the other two play as a measured platformer with life bars. In the end, all games are great. A classic trope of old school games is the progress map between stages. Shadow Dancer has some interesting mechanics in gameplay. The most obvious being the addition of the helper dog, or wolf, I'm not sure. When facing an enemy, if you hold down the attack button the dog icon will fill up and flash, and when released, the dog will rush to bite and distract the enemy, giving you an opportunity to sneak in and attack. This is especially useful if there is an armed sentry firing from a distance. This does not work all the time, as certain blade-wielding enemies will hurt the dog, rendering him harmless for a period of time. See the dog biting the enemy sentry? You can choose to play with or without shurikens, making for a increased replay value. The melee attacks, such as punching, kicking, and sword slashing, are invaluable to master if you want to make it far. Contact with an enemy only knocks you back, unless the enemy has a blade. Knowing the timing of the attacks and recovery from contact are necessary for battling hordes of ninjas in close quarters. Battle in tight quarters are challenging but rewarding to overcome. The level of challenge is moderate. For Shinobi veterans, this will only get challenging in the mid to late stages. Enemy patterns are easily learned, but additional challenge is incorporated by use of the environment. An attacking ninja is no real problem alone, but multiple ninjas with limited space is another story. Boss battles are enjoyable and unique. At the end of each 3-part round is a boss battle. Each boss is different and has relatively easy patterns to figure out. You have ninja magic to rely out to get you out of a jam, and it will deplete the boss of two hit points. Thus, you have boss fights that aren't too frustrating. The sky darkens successively from one bonus stage to another, a nice touch. In-between rounds there are bonus stages where you jump from a skyscraper and hurl shurikens at as many ninjas as possible. Hit all 50 and you get three extra lives. A classic shinobi theme that is a lot more manageable than the nearly impossible shooting gallery in the original game. There are four different kinds of ninja magic, and you don't have a choice of which one you can use (at least I don't think you do). Once per stage is the limit, but you score big points if you make it through that stage without using it. Ninja magic is always fun to watch. The graphics are excellent through most of the game. The character sprites are excellently drawn, the movement animations are fluid and natural, and the boss designs are creative. There are a couple of instances where the background graphics look like they were designed by a summer school intern, like the Statue of Liberty head in stage 3-3. Other than than, it is a pleasure to look at. Stage four is visually interesting as there are looming shadows that conceal enemies as well as your character. You need to tread lightly and watch for what passes into the shadow as it will eventually reappear on the other side and surprise you. Overall this is an excellent game. It conjures the arcade aesthetic of the original game, and plays light on its feet. It is the overlooked black sheep of the series, but deserves a second look.